Upcoming ACT event with filmmaker Lucy Walker, who directed the documentary Wasteland. This documentary has been on my "to watch" list since even before its Oscar nomination. Hooray for trash people getting press! How do we observe or quantify the impact of an artistic intervention or the impact of a documentary film? 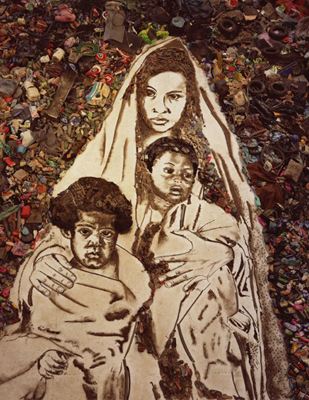 Lucy Walker will be reflecting on the experience of making and showing the film Waste Land, a documentary about artist Vik Muniz’s collaboration with the self-designated recyclables materials pickers of Jardim Gramacho, the largest landfill in the world. The film has won over thirty international awards and was nominated for the Academy Award for Best Documentary. Lucy Walker has directed four award-winning feature documentaries: Devil’s Playground, Blindsight, Waste Land and Countdown To Zero. Lucy Walker’s latest film, The Tsunami and the Cherry Blossom, is among the eight shortlisted contenders for the 84th Academy Awards’ best Documentary Short Subject category, of which three to five films will earn Oscar nominations. (See directions below.) Free and open to the public. ooooh monday night! i wanna go!